-Canada Holds on to Second Spot and Australia Slips to Number Three? 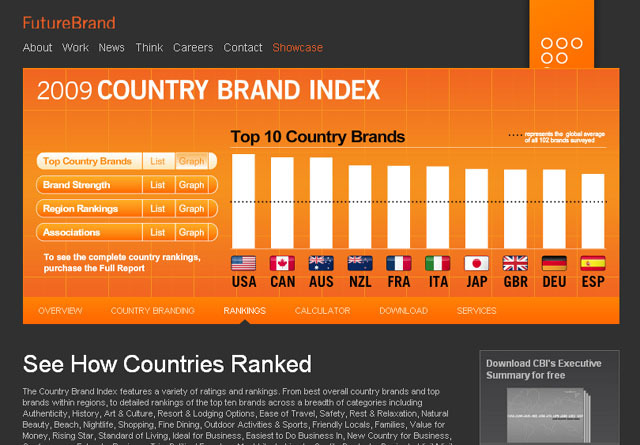 The United States earned the coveted spot as the world’s top country brand for the first time in the fifth annual Country Brand Index (CBI), rising from the third spot in 2008. Canada, host to the 2010 Winter Olympics, held on to the second ranking as Australia, always a perennial favorite, slipped from the premier ranking to number three. 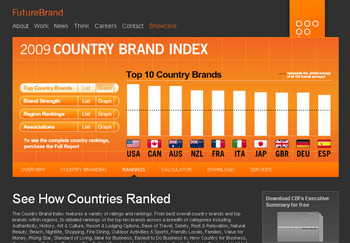 Other countries making the top 10 of the global 2009 CBI study include New Zealand, France, and Italy. CBI is a comprehensive study of approximately 3,000 international business and leisure travelers from nine countries. It examines how countries are branded and ranked, and identifies emerging global trends in the world’s fastest growing economic sector ? travel and tourism, which accounted for US$944 billion in international tourism receipts in 2008.